CT's clean energy edge: Going, going . . . or coming back? Michael Brookman, the president and founder of a clean-energy startup in Connecticut, was pretty sure he had a good idea. It was a small unit that could make an existing boiler more efficient and provide heat and power to individual homes – even during a power outage. From home base in Branford he began looking around for a state partner. He finally found one, so on Feb. 1 Brash Power and its anticipated assembly plant jobs will relocate to a clean energy incubator in Binghamton, N.Y., under the auspices of NYSERDA – the New York State Energy and Research Development Authority. As for Connecticut: “They just sent us a ‘Dear John’ letter,” Brookman said. The missed opportunity with Brash Power is thought by some legislators and advocates to be symbolic of Connecticut’s current state of clean and renewable energy policy, commitment and business. Once a national leader in these categories, in recent years the state has slipped behind many others, including neighbors New York, Massachusetts and Rhode Island, each of which is pursuing aggressive, if not radical, clean energy agendas and taking risks with policies never attempted before. Connecticut, some say, has lost its clean-energy edge. The bulk of the finger-pointing is at the budget and long-term financial situation and more directly at the legislature, which many believe made a bad situation worse last session by taking ratepayer funds intended for clean-energy and energy-efficiency programs and using them to help close a budget deficit. 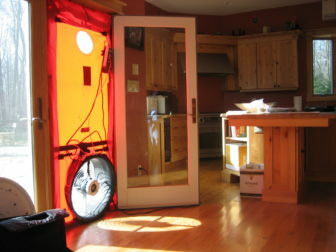 A fan is fitted to the door of a home to test how tight the house is against air leaks. But arguably, the state began slipping only a few years after the initial flurry of game-changing energy programs were instituted at the start of the Malloy administration. Critics blame the kind of short-sightedness that sent Brookman to the exit and often results in too much focus on present high electric rates instead of long-term electricity costs paired with climate change benefits. The question among clean-energy advocates is whether Connecticut can once again become a leader and gain the economic benefits they believe will follow. Klee took over from Dan Esty, who created DEEP from the Department of Environmental Protection and who many – while still praising Klee – said had a style of assertive leadership and a bold vision that seems to be missing now. It would take a lot of catching up, according to a new analysis by Acadia Center, the environmental advocacy group that operates throughout New England and New York. Acadia looked at nearly two-dozen benchmarks in four energy categories – electricity, transportation, grid modernization and buildings – and Connecticut tops only one – electric vehicle incentives. Not too many years ago Connecticut topped most of them. New York, with its Renewing the Energy Vision grid modernization and top-to-bottom re-imagination of electricity generation and distribution, is a clear national and regional leader. 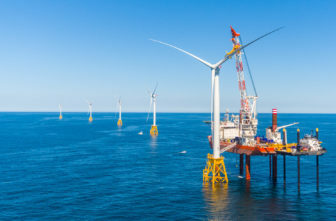 Massachusetts, under Democratic and Republican governors, has instituted sweeping policies with aggressive renewable energy projects, including a mandate for 1,600 megawatts of offshore wind. Rep. Lonnie Reed, D- Branford. Connecticut, once the most aggressive states in the country on its renewable portfolio standard (RPS) – how much renewable energy that it requires be used – doesn’t even register on regional assessments anymore. At one time the state was a national leader on energy efficiency, but that is likely to change since $127 million in energy efficiency funding was removed from the two-year state budget to help close the deficit. “It feels like we’re a little bit back to square one on energy efficiency in Connecticut in 2018,” said Bill Dornbos, Hartford-based advocacy director and senior attorney for Acadia. Programs like Lead By Example, which was designed to upgrade the efficiency of energy systems in state buildings, thereby saving the state money, have languished. The popular and successful commercial clean-energy programs are a year past their scheduled expiration, have been given a one-year extension and are facing the possibility of another. Plans for community solar – solar projects that make power available to homes unsuited for their own systems – have struggled for more than three years with a pilot project that’s still barely functional while many states – including Massachusetts – are putting up projects as fast as they can. And legislative battles over whether farmland should be used for renewable energy projects have derailed some and stalled others, while Massachusetts dealt with the same problem quickly with a tiered incentive system. Among the gripes expressed privately by advocates and some legislators, who are reluctant to criticize their colleagues publicly, is that the Energy and Technology Committee is too timid, too willing to accommodate the utilities, overly consumed with the Millstone Nuclear Power Station controversy – to the exclusion of other issues – and not well-versed in the admittedly complicated clean-energy world. All of it has been compounded by many changes in Senate leadership in the last few years. Lawmakers complain the state’s Comprehensive Energy Strategy update, due to be released in the next week or so – is now a year-and-a-half late. Its draft version was widely criticized – called a failure by some – for policy changes, including a proposal that capped subsidies for home solar power in favor of grid-scale projects, that many felt would set the state even farther behind than it already seemed to be. Renewable energy requires a sustained, large-scale commitment to get its cost-benefit ratio to a point that it’s useful, said Sen. Tony Hwang, R-Fairfield and co-vice chair of the Energy Committee. “Unfortunately our budget structure and our deficit environment have created a very unpredictable and virtually unsustainable environment to make these necessary investments. But possibly nothing set off DEEP leadership, legislators and environmentalists more than the funding sweeps from the Green Bank and the Energy Efficiency Fund. “It is hard to express how frustrated I am with the fact of how short-sighted that was of the General Assembly,” Klee said. The cuts in energy efficiency funding will drastically reduce the services that have been available for years, including energy audits and more efficient heating equipment and insulation that could help people lower energy bills. DEEP estimates several thousand jobs could be lost. It also could keep the state from meeting its efficiency obligations to the Independent System Operator that runs the New England power grid. If that obligation is not met, Connecticut could face penalties as high as $30 million over 10 years. The Green Bank cuts have sparked some of the greatest exasperation. As the model for green banks worldwide, Connecticut’s bank uses the $27 million it receives in ratepayer fees and some other funds to leverage money for loans and other financial products through partnerships with private financial institutions and others. Since it was formed in 2011, for every dollar the bank received in ratepayer funds, it has attracted eight dollars in private capital that helped create programs, jobs and tax revenue. The sweeps took more than half the Green Bank’s funding – nearly $16.5 million in each of two years. Five of its 50 staffers were let go. But the health of the bank’s balance sheet is what attracts the investments and allows for favorable terms – a concept many believe lawmakers either didn’t understand or chose to ignore. “Legislators see a number on a balance sheet not realizing it is the strength of that balance sheet that we’re able to use to attract more investments.” said Bryan Garcia, Green Bank president. 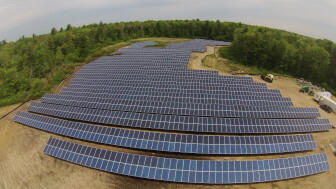 A shared solar field in Rehoboth, Mass. Investment in the concept is heavy in that state. There was an instantaneous lesson in what the fallout could be without it. One large financial institution withdrew from a plan to loan the Green Bank $10 million over 10 years at 1 percent interest. The bank was able to salvage a deal with Bank of America to provide funds for solar systems on nine buildings in the state college and university system, but the terms were adjusted to be a little less favorable. And a plan to provide the Farmers Cow dairy cooperative with financing for an anaerobic digester to turn cow manure into energy became only a loan guarantee, forcing the cooperative to find the funding elsewhere. The bank is restructuring itself to bring in higher returns and move its popular low- and moderate-income solar program to a new non-profit spinoff. It also plans to eliminate financing for community solar, anaerobic digestion, combined heat and power, microgrids and an electric bus pilot project. Gina McCarthy, a Green Bank board member, former Connecticut environmental chief and most notably Environmental Protection Agency administrator during the Obama administration, who now runs the Center for Health and the Global Environment at Harvard, said reducing the Green Bank’s funds was the exact wrong thing to do because it would probably send investment dollars, jobs and tax revenue elsewhere. “In a bank you need money to make money. It’s as simple as that,” McCarthy said. And she said, you shouldn’t be afraid to do that even in tough economic times. “I understand they’re struggling. Even people who are struggling to make ends meet, they’re going to pay for a bus pass in order to get to work, because that’s how you make your money,“ she said. Legislators said sweeping the Green Bank funds was a tough choice, but the money was needed for other human services deemed more pressing. There may be a reason to have a little. As the legislative session begins next month, Klee and legislators have vowed to propose strong agendas to kick-start clean energy. A “jack-up vessel” installs the final blade on a wind turbine in the Block Island Wind Farm. The Comprehensive Energy Strategy is expected to have a more aggressive requirement for clean energy use to align with interim benchmarks for greenhouse gas emissions approved just last week by the Governor’s Council on Climate Change. Emissions will have to drop to 45 percent below 2001 levels by 2030 to get the state back on track to meet the level set in the Global Warming Solutions Act of 80 percent below 2001 levels by 2050. 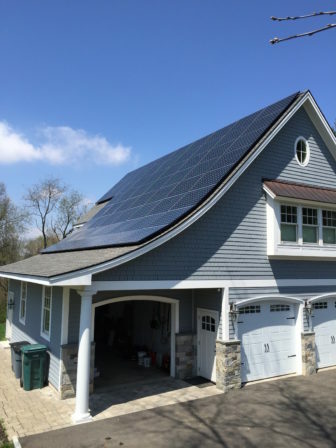 The strategy also is expected to forgo the cap on home solar that was in the draft, provide a replacement for the commercial clean energy programs now running on one-year extensions, and offer new efforts to push community solar and Lead By Example. Also cause for optimism was a meeting in the last couple of weeks by a bipartisan group of a dozen legislators – most of them Republican – in what is being called a revival of a dormant renewable energy caucus. While some have pointed out that because the meeting was pulled together by an advocacy/industry group – Solar Connecticut – it’s not a legitimate caucus, many still said they were encouraged. Energy Committee leaders are planning extensive educational sessions for members in an effort to avoid what they and others see as the lack of understanding that allowed the Green Bank and energy efficiency sweeps to go through last session. And co-chair Reed said she would re-double her long-articulated effort to find regional solutions to the state’s energy needs and goals. To that end, advocates say they’re encouraged by a draft request for proposals for procurement of offshore wind energy after foot-dragging by the state while neighbors Massachusetts, Rhode Island and New York zoomed by. Granted it’s only a small amount, but Acadia’s Dornbos said it’s a massive improvement since there was no offshore wind on the horizon less than a year ago. “Is there more work to do? Yes. Would there need to be a clear procurement mandate at some point? Yes. But we’re much more encouraged by that change of position than on some other issues,” he said. There are still concerns, however. The latest wrinkle is President Trump’s decision to place large tariffs on imported solar panels that could once again put solar systems out of reach for many, and hurt local solar companies. 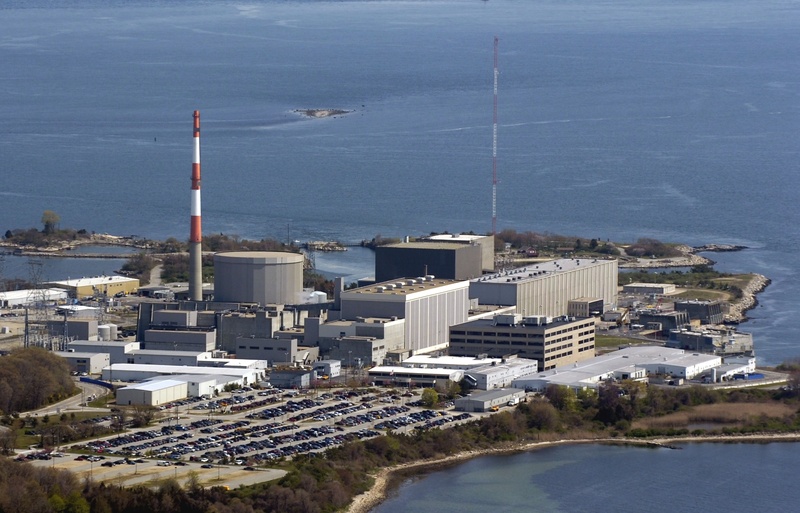 Another is that the legislature could get bogged down for a third year over how to handle the threatened retirement of the Millstone Nuclear Power Station. Monday DEEP offered Millstone’s owner Dominion a qualified opportunity to bid against other non-carbon-emitting energy sources to provide power. But there’s no assurance Dominion would be successful in its bid. While legislators uniformly expressed deep Millstone fatigue and the hope that it would not be a distraction again this session, there are no guarantees. The Millstone plan came just days after ISO-New England released a fuel security analysis that assessed the grid’s winter reliability. The analysis considered 23 hypothetical scenarios – including one in which Millstone’s 2,100 megawatts were not available. The scenarios were all run for the winter season – Dec. 1 through Feb. 28 of 2024-2025 – and assumed no additional natural gas pipelines but accounted for demand reductions from energy efficiencies and rooftop solar power and the continued closure of coal and oil generators. In all but four cases, the scenarios resulted in fuel shortages that required rolling blackouts to address – a potential argument for keeping Millstone operational. The Millstone plan also follows the frigid spell in the Northeast that magnified the vulnerabilities of the grid and its energy supply chain. With natural gas supplies targeted for heating needs, the entire system relied more heavily than it has in years on oil generation. Coal was used heavily. Together they threatened to exceed emissions levels. Delivery systems for all three fuels were strained and supplies of oil especially ran perilously low. Energy prices spiked at more than 10 times normal for short periods. All of it was detailed in a report by ISO-New England. Clean energy advocates are concerned that grid reliability worries might send lawmakers scurrying back to fossil fuels as well as something to better guarantee Millstone’s operation. “I don’t want to keep having a Millstone discussion,” said Sen. Paul Formica, R-East Lyme, who represents Millstone’s district and serves as co-chair of the Energy Committee. He advocates stabilizing baseload power – such as Millstone – for five to eight years so attention can focus on renewables, which he said the state could do in spite of its budget problems. But the hurdle of convincing business leaders and others that clean or renewable energy doesn’t automatically mean higher energy costs remains.